RTV 500 Modified-Alcohol Cure Series is ideal for applications that require quick cures and early green strength development on electronic components, circuit boards and other sensitive components. RTV 500 Series is a UL recognized component. As an adhesive, RTV 500 Series sealants out performs slower materials in multi-step assembly applications where the fast tack and early strength are needed as a unit moves from station to station. 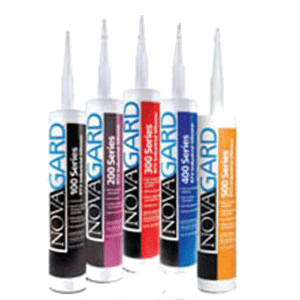 Description: Novagard Modified Alkoxy silicone sealants are non-corrosive, single component pastes. These products are non-corrosive when tested in accordance with Mil Spec A-46146B. Ideal for applications that require quick cures and early green strength development on electronic components, circuit boards ad other sensitive components. Special Characteristics: Non-corrosive when tested to Mil Spec A-46146B, quick cure and early green strength. Physical Form: One-part non-slumping RTV; cures at room temperature on exposure to moisture in air to a tough, rubbery solid. Description: This sealant is formulated for application in assemblies requiring flame retardancy. This low odor material is UL recognized and complies with testing requirements of UL 94 V-0, a vertical burn test that evaluates self-extinguishing characteristics. Physical Form: One-part non-slumping modified alcohol cure RTV; cures at room temperature on exposure to moisture in air to a tough, rubbery solid.